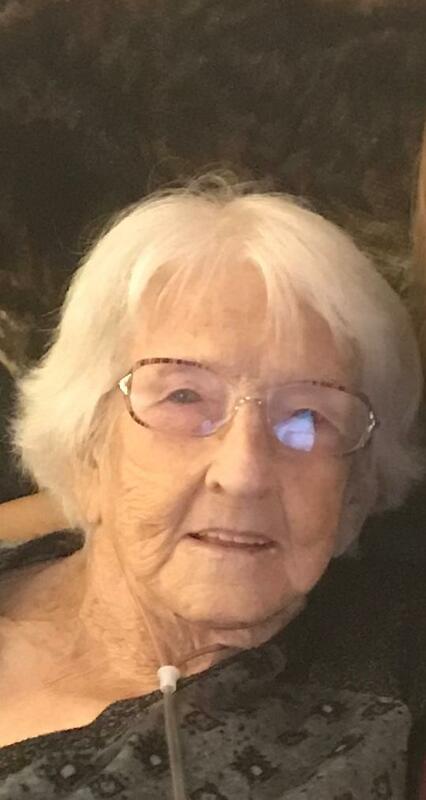 Eulah Mae Burgess passed away January 30th 2019 at the age of 97. She was born and raised in Blair, WV. She graduated from Sharples High School in 1940. She promised Edward Burgess Jr that she would marry him after he returned home from the second world war. They were married in 1946 making her the wife of a coal miner. They had two children and she was very devoted to her family. She later moved to Cleveland, Ohio with her husband and children. There she worked at various jobs, one being ” Marsh Allen” in Cleveland. When she and Jr. retired, they moved to Buffalo, Ohio. There, they could enjoy various hobbies. She loved to sew and make quilts. Also loved gardening, growing her own vegetables, canning and flowers. She had a green thumb like no other! She loved country music, especially George Jones. She went to quite a few country music and gospel shows over the years. She loved attending the Grand Old Opry in Nashville. She also liked traveling with Jr as a “snow bird” to Florida in the winter time. She loved cats and had many over the years. In 1997 she moved with Jr. to Wooster, Ohio. He passed in May of 2000. Eulah was preceded in death by her parents. Marshall O. Burgess and Clara A. Burgess (Mullins). Her husband, Edward Burgess Jr. Her brothers, Frank, Delmar, Arlee and Don Burgess. And sisters, Myrna Parcell, Stella Crum, and Olive Browning. A daughter, Gloria Gail Burgess, and a great grand- daughter Jordyn Burgess. She is survived by her son, Edward D Burgess (Janice) of Rocky Mount, Va. Her grandchildren, Kristina Streer (Richard) of Wooster, Oh. William E Burgess (Kristine) of Creston, Oh, Ernest K Burgess of Crossville, Tn, and Ashlee Burgess Cook (Jeremiah) of Rocky Mount, Va. She had 9 great grandchildren: Lee, Aaron (Tara), Chase, Mikayla, Jasmin, Ryan, Trinitee, Makenna and Levi. 6 step great grandchildren: Jeff, Brian, Joey, Cameron, Cayla and Caleb; 4 great great step grandchildren: Addison, Cooper, Johnny and Parker ‘whom she called Porter” and many much-loved nieces and nephews. She was a member of the Blair Methodist Church, the Buffalo Methodist Church and later enjoyed attending the Canaan Freewill Baptist Church in Creston, OH. She was a devout Christian who loved God. A devoted wife, loving mother, grandmother and friend to many! There will be a small family gathering to celebrate her life at White Oak Cemetery in Blair, WV on May 26, 2019. Anyone who wishes to attend is welcome.